On September 27th Connex in Sweden sacked Per Johansson for alleged disloyalty to the company. 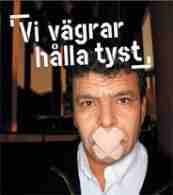 Per Johansson is chairman of the tube drivers' union (SEKO) in Stockholm representing 700 workers. Connex runs the Stockholm tube system. Per Johansson and the elected safety controllers (equivalent of health and safety representatives) have pushed for safety improvements and exposed several serious weaknesses. The safety controllers have been successful in stopping the job on 3 occasions after accidents - one in particular was a fire at Rinkeby Station which injured 16 passengers. In Sweden safety controllers have the legal right to stop the job. They have also exposed the fact that some alarm telephones and emergency exits don't work. It's not only local representatives that have been exposing Connex safety failings. "Connex had systematically ignored notifications from state bodies such as the Workplace Security Authority and the Railway Board," Per Johansson has been quoted as saying. "It's an attempt to scare us into silence, because they know that Per Johansson has not acted on his own," comments Moncef Jerbi. secretary of one of the sections of the branch. Since the sacking, the tube drivers' union has thrown its weight behind Per Johansson with a campaign of meetings, demonstrations, a strike on the morning of October 6th followed by a lobby outside Connex' headquarters in Stockholm. "Sack Connex, not Per!" was one of the slogans shouted. The latest action has been a 24 hour strike on November 18th with a demonstration attracting supporters from all over Sweden on the same day. The union called for international support by demonstrating in front of Connex offices or any office that represents the mother company Veolia, the owner of Connex, Onyx, Dalkia, Veolia Water and others. There has been widespread support for the re-instatement of Per Johansson amongst the people of Sweden. There has even been support from unlikely quarters such as some of the usually anti-union press. There have been demands for the regional council (which is in charge of local transport) to sack Connex - to end its contracts. That would be a very popular outcome! There are thousands of ex-Connex workers in Britain that hope the Swedish tube workers win this important battle.